Backpacking nine countries for 50,000 pesos is the bold marketing claim of the most recent book by Robert Alejandro entitled “The Sketching Backpacker “. Published by ROX (Recreational Outdoor Exchange) Philippines, the book aims to entice local backpackers to do a circuit around South East Asia and some parts of China on a measly budget. Being a long time fan of Robert Alejandro’s graphical works, I was excited about this book, but does it deliver as it was purported to do? The book, larger than your average trade paperback spans 231 pages of recycled paper. Flicking through the pages, I’m just amazed by the numerous sketches found on this book. Being an artist myself, I really appreciate people who can doodle fast yet retain the distinct character of the subject he is drawing. It is not an easy task and it is a skill honed through many years. Robert Alejandro’s sketches of the French Colonial houses in Laos, the familiar Le Village hotel in Kuala Lumpur, the bustling scene of Khao San Road and train transit scene in China to name a few were brilliant. Having been around most of the countries in South East Asia and some parts of China as well on a backpacking trip myself, I have no doubt that it was possible to do the trip (going chronologically from Singapore, Malaysia, Thailand, Laos, Cambodia, Vietnam, China, Macau, Hongkong and finally back to the Philippines) for 50,000 pesos, but I was more interested to read how Robert Alejandro and his friends went through their journey for 10 weeks. While the books has some moments like Robert, loosing a bag early on during the trip, a friend of theirs being hospitalized after eating a Happy Pizza (with sprinkles of marijuana) then seeing dead people while on a highin Cambodia and enduring a 20 hour hard seat train ride to Shenzen which I find captivating. I noticed that the author tired to narrate some events and impressions here and there, but a lot of the details of the trip and how they go about it are literally “sketchy”. I did find some general facts about the destination and accommodation recommendations useful, but I found the content lacking in details like the road conditions, park fees, who were their operators on their Halong Bay trip or where’s a nice cheap place to eat to name a few. I know Robert Alejandro tried to convey the experience through his sketches but it really doesn’t offer more than that along some short captions. It’s hard not to compare this book to “26 Days Around the Philippines” by Carlos Libosada which is also filled with illustrations and exciting run through of going from one place to another in excellent detail. 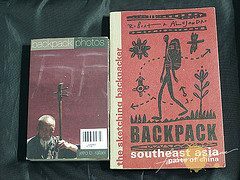 The later book, which is also published in the Philippines, way back in 1999, is still personally one of the best backpacking guide done and published by a Filipino. 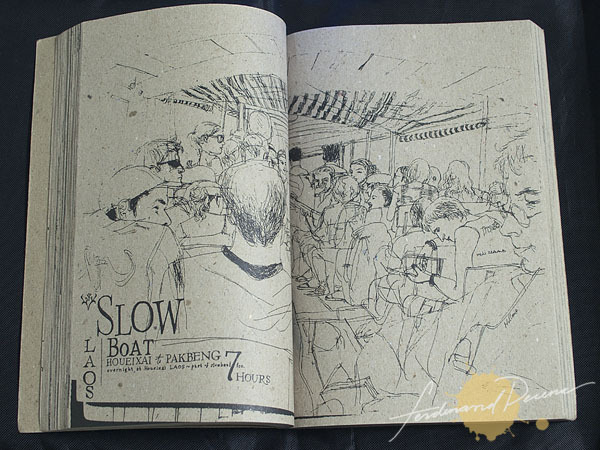 Bottom line, the book “Sketching Backpacker” is 80% art book and 20% description and detail. If you are looking for a guide on how to backpack around South East Asia on a budget, it’s still best to buy those shoe string guides. Also, their routes through the 9 countries is more on the tourist trail, it’s a lot useful if you want to visit only key highlight destinations on a country but if you want to veer away from the tourist trail like most backpackers do this one doesn’t give that many suggestions aside from their “Secret Wall Tour” in China. However, if you are a fan of Robert Alejandro and appreciate the art side of this book it may be worth your while. 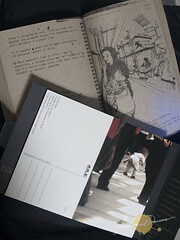 The “Sketching Backpacker” is available for P390 standalone at Papemelroti. ROX also sells them on bundle with Jetro Rafael’s Backpack Photos which is a nice postcard compilation of photos during their trip for P750. i had the same impression as you did especially the part where you said it’s 80% art book and 20% descriptions. it’s probably good-intentioned to use recycled paper but i just wished they used the whiter kind. the brown paper almost looks like kraft paper and it didn’t do justice to his sketches. napansin mo rin yung sa halong bay 🙂 i find the marketing line of backpacking southeast asia and parts of china on 50,000 pesos deceiving. i bought the book on this premise and the details are really measly. pricewise, i find it a bit expensive at nearly 400 pesos for the kind of info it offers. i mean, i liked the sketches but the promise of inspiring me with details of the backpacking journey was simply left out in the book. perhaps it would’ve been better if robert teamed up with a writer. it doesn’t have to be copy-heavy basta comprehensive and insightful. Thank you very much for the encouraging words and constructive comments which will be VERY helpful if (i hope i can) i make another book! I agree with what you said here Oggie. A team up with a writer would be great but I guess Robert didn’t really have an idea that he would be making a book out of their trip before. Hi Robert! Thank you very much for your visit here. I thought you really did an excellent job for the book but the marketing was a bit misleading. Still a fan here and looking forward to your future works. Somebody emailed me this link. Robert, i-compare ba naman tayo! ha ha! Nyways, thanks for the marginal review, naka-sawsaw ako sa article about robert alejandro! yehay!! Beyond the details, readers should also look at the character of the book. It is very seldom that we see a travel book of this kind. For me, a book is not about the price, how many were sold, or how deep is the amount of details. Its the number of people who got inspired after reading the material. Hi Caloy! Very honored to see your comment here. Honestly I am a fan of your book and true it has inspired me to travel on my early days. While I agree that the book has real character, but I guess the marketing as I say is deceiving. A person would buy this book on the premise he would know “How to travel on the 9 countries for 50k”. So when I finished it, it left me a bit short on what I have expected it to be. Now will I bring this book again on my travels? No. Will I read it again? No. Will I browse through it? Yes, probably to look at the sketches and some of the details. If they told me I would be buying more of a Travel Sketchbook than a guidebook then I would have been more happy and inspired with it since I know what I’m getting myself into. I hope you don’t mind. I would like to inform you that a friend and I developed an iPhone application on travel in the Philippines. Its a FREE app which can be downloaded by users of iPhone, iPod Touch and iPad (nakasunod na yung ibang platforms like Nokia and Google Phone). In the Apple App store, search for the words – MY TRAVEL PHILIPPINES. Could you please help me spread this thing and make more people aware and be armed with more travel info about the Philippines? Thank you and warm regards.